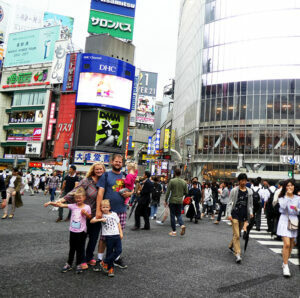 The ultimate touristy thing to do, when in Japan, is cross the Shibuya Scramble Crossing. This intersection has five different dedicated crosswalks intersecting six different streets below five different city stop lights. All at once, every single light turns red and pedestrians rule the road. 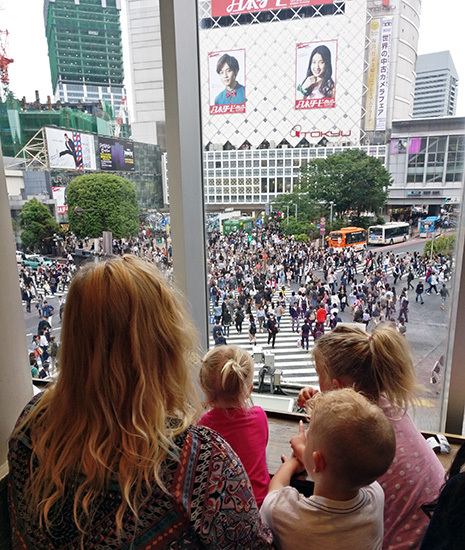 The internet claims that Starbucks offers the best view of the Shibuya Scramble Crossing from an elevated height. This is the busiest Starbucks in the entire world. Other people recommend to start here, get a lay of the land, and then make your way down to the street. The stairs to the upstairs viewing area is hidden behind a huge winding line out the door for coffee, and is jampacked full of people who also blindly followed the interwebs directions. Obeying the internet and watching the street from the Starbucks. It only took 20 minutes to sit down in front of the window. 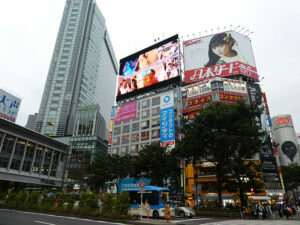 The view from Starbucks does offer a great direct view of the East to West Shibuya Scramble crossing. Poised before the most popular east side entrance sits the dog, Hachikō, a famously loyal dog in Japanese culture that waited 9 years for his owner to return home from war. 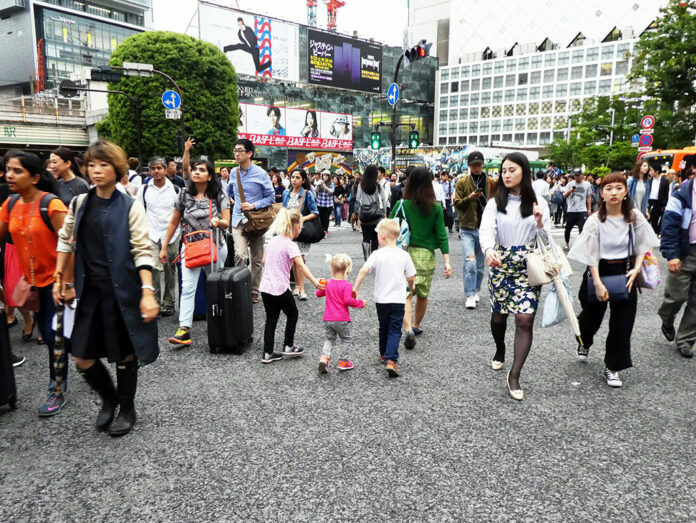 But, if you can’t find a seat at Starbucks, or you don’t want to bother trying, a much simpler way to view the crossing is to stop on the pedestrian bridge before exiting the main Shibuya train station to the south. This offers a broader view of the entire South to North crossing, and just as much perspective without the crowds. Behind this bridge, on the far south side sits Moyai, a statue resembling the heads at Easter Island. Or,… you can just jump right in. The truth is, there isn’t much to do besides cross the street. Sure, it’s a bit intimidating at first: Hoards and hoards of people cross all at once, numbering in the thousands depending on the time of day, or day or the week. 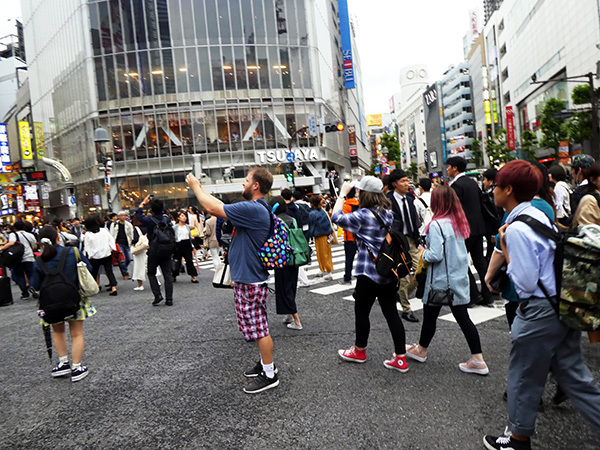 There is no clear delineation of which path to take, and in the center of the intersection people are jumping into the air taking pictures. Just go for it! 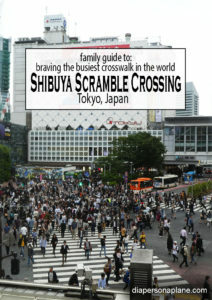 There is plenty of time to cross the intersection, jump around in the center, chase your brother and sister, do several full 360° turns, and make it safely across Shibuya Scramble Crossing. Still packed full of pedestrians during the day, the street comes alive at night. The excitement of the neon flashing lights in downtown Tokyo, and giant screens looming overhead coupled with the swelling crowds of people packed in shoulder to shoulder serves as an amusement park for your senses. Tokyo is a place like no other. ► For Kids: This was a simple, yet great activity for the whole family. The kids felt adventurous running headfirst into the sea of people, and loved that they didn’t have to hold anyone’s hand. Parents can rest assured: This is a safe zone. Even if pedestrians are in the road after the stop lights turn green, Japanese drivers will wait for the crossing to be empty before proceeding. Because this is such a busy intersection, many cars don’t even use this avenue to drive through Downtown. 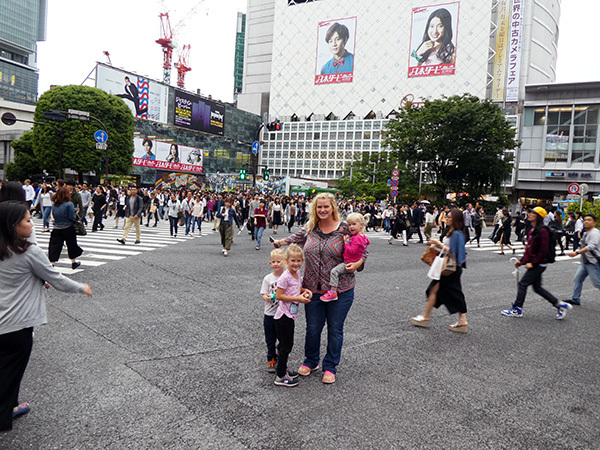 Have you had a chance to cross Shibuya Scramble Crossing? 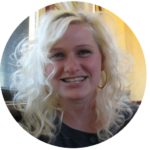 Did you think it was awesome, or not all that is was cracked up to be? Call us easy to please, but for simply crossing the road, this is such a fun experience. 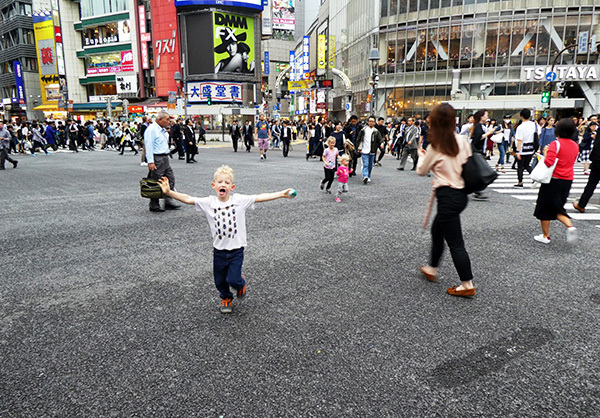 ► Nap-Time Version: Shibuya Scramble Crossing is the busiest pedestrian intersection in the whole world! Don’t miss it! While you’re here, pop into Alice on Wednesday, do a bit of shopping around downtown, and test your luck at Don Quijote.